Laymyo period had four capitals. Pyinsama was the first capital of Laymyo period and it last 285 years from AD 818 to AD 1103. Purain was the second capital of Laymyo period and it last 57 years from AD 1103 to AD 1160. Nayrinesara was the third capital of Laymyo period and it last 86 years from AD 1160 to AD 1246. Laungkyat was the fourth capital of Laymyo period and it last 184 years from AD 1246 to 1430 AD. Those four cities were situated along Izananadi river, thus, those periods are called Laymyo period in reference to those four cities. The river is also called Laymyo river in reference to those four cities. The fifth descendant of king Lat Kya Min Nan, the founder of Purain city in Lyamyo period, was king Kaw Li Ya. He did Athaditha donation. The stone inscription written with two inches-sized words on the large natural rock of Kawliya mountain, can still be seen until now. Although the rock layers had detached from the large rock, the inscription on the rock can originally be seen marvellously. Such king Kaw Li Ya erected the Buddha image three miles away from the south-west of Purain city and seven miles away from the south of Marukoo city in AD 1123. The hill the image stands, is fifty feet high. That Buddha image was sculpted in the local rock mountain by cutting it. Such locality was called Ngakaukra because the king said, “Ngakaukra.” It means that he found the stone easily to sculpt the Buddha image. After the long time had been moving, nowadays, that locality is called Ngarakauk. King Kaw Li Ya placed the Buddha image on Sandapatvata mountain and covered it with the stone umbrella. He worshipped the image by placing it in the stone cave. Such Buddha image was named as Mahahti because it was covered with the stone umbrella. During the first Anglo-Myanmar war, Buddha image damaged into fragments, and the whole cave also destroyed as the British captain fired the cannon at the cave in which Myanmar soldiers defended. The village situated in the place in which the British captain Baw Raw had stationed, is called Thwraw village. 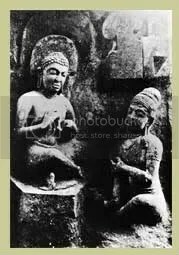 The villagers near Mahahti Buddha image, rebuilt the image combining the fragments they found, but they had to substitute the necessary things with bricks and cement as they didn’t find all original fragments of Buddha image. The Buddha image is eight feet high. The local villagers built a pagoda as well. The prayer hall is in the east of the pagoda. There are two ways to the pagoda: the king way and the queen way. The flat stones were laid in order on the road from the harbour to the stairway of the pagoda because the king came to it by barge for his pilgrimage. Nowadays, the board of trustee maintains the pagoda.